In recent days Jared Kushner’s security clearance was downgraded and his right-hand man revealed he intends to resign. Meanwhile, reports emerged that Kushner’s family business won around $500 million in financing from two U.S. firms after he met with them at the White House, Special Counsel Robert Mueller is looking into Kushner’s talks with overseas investors, and at least four foreign governments plotted to manipulate the princeling. Privately, some aides have expressed frustration that Mr. Kushner and his wife, the president’s daughter Ivanka Trump, have remained at the White House, despite Mr. Trump at times saying they never should have come to the White House and should leave. Yet aides also noted that Mr. Trump has told the couple that they should keep serving in their roles, even as he has privately asked Mr. Kelly for his help in moving them out. Way back in July, when the White House was filled with an almost entirely different cast of characters, Jared and Ivanka welcomed Kelly’s arrival at the culmination of a dramatic West Wing purge. Jared and Ivanka backed Anthony Scaramucci’s hiring as communications director, which immediately prompted Press Secretary Sean Spicer’s resignation. In a profanity-laced rant, Scaramucci vowed to push out Chief of Staff Reince Priebus, with whom Jared and Ivanka had become disenchanted. A day later Trump announced that Priebus had been replaced by Kelly — who then turned around and fired Scaramucci. Jared and Ivanka seemed to shrug off Scaramucci’s instantly legendary exit, and were said to be pleased at the prospect of Kelly bringing order to the Trump administration. However, any chief of staff — let alone one trying to impose military precision — would be irked by Jared and Ivanka’s roles as presidential advisers/family members. It’s now apparent that Kelly sees them as part of the problem. During Kelly’s tenure, Kushner saw his absurdly large portfolio whittled down to mainly Middle East peace and China policy. Their simmering feud seemed to hit a breaking point with the Rob Porter scandal. The revelation that an alleged domestic abuser was working as staff secretary with an interim security clearance raised questions about why Kushner and others still didn’t have proper clearance — and in turn led to calls for the chief of staff to step down. As Vanity Fair’s Gabriel Sherman notes, by downgrading Kushner’s clearance, Kelly expertly flipped the situation, using the uproar over security clearances to neutralize his foe. Even if Trump overrode the decision, he’d have to explain why he was letting his family members view classified information, but not the dozens of other staffers who had their clearance revoked. While the focus has been on her husband, Ivanka has seen her own share of controversy in recent weeks. Kelly has privately remarked that she is just “playing government,” according to CNN, and dismissed her child tax credit as “a pet project.” He and others in the White House were said to be annoyed that she led the U.S. delegation to the Olympics closing ceremony, though she has no expertise in the sensitive situation on the Korean Peninsula. Ivanka got a scandal to match her husband’s on Thursday night when CNN reported that the FBI has been looking into the negotiations and financing surrounding the Trump International Hotel and Tower in Vancouver, which may be delaying her full security clearance. It’s possible the property — which opened a month after Trump took office — came up as part of the routine scrutiny of foreign contacts that’s part of any background-check investigation. However, there may be a connection to larger concerns about Trump’s Russia ties. While the Trumps only license their name and manage the property, the Russian-Canadian developer who built the tower had recently done business with the Russian bank Vnesheconombank, which is now subject to U.S. sanctions. 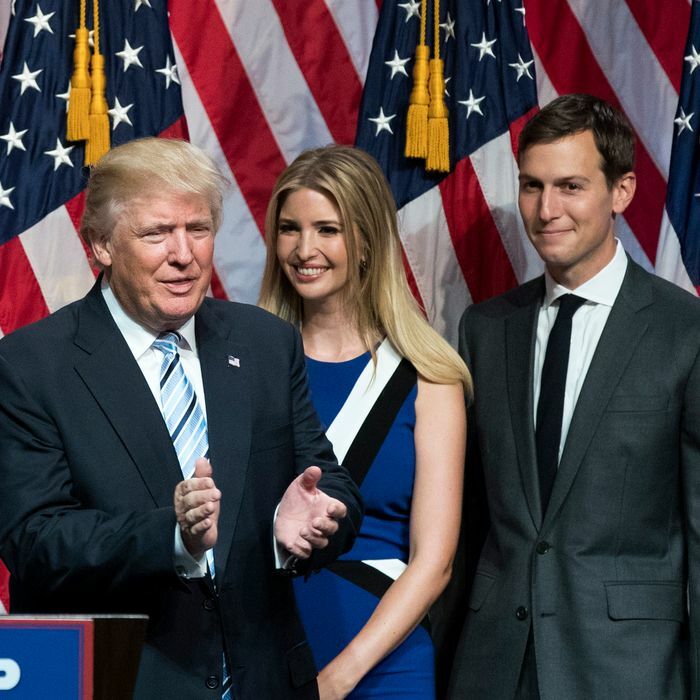 While the idea that the president himself may be secretly plotting to oust his daughter and son-in-law from the White House is quite a juicy plot twist, it’s also one of Trump’s more astute staffing decisions. Not the part where he’s incapable of firing them himself, of course, but his recognition that Jared and Ivanka are massive liabilities who contribute very little to the success of his administration. Why didn’t anyone try to tell him that the president shouldn’t hire his own family members?